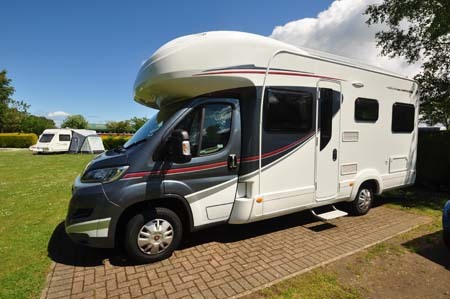 Plenty of motorhome folk aspire to an Auto-Trail, but they aren’t necessarily the least expensive motorhomes money can buy. The Imala range, introduced for this year, has had a good stab at addressing that, though. 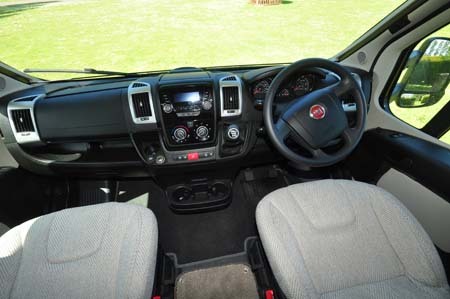 The 720 here is the largest model in the five-strong range, but it also goes on to offer a Hi-Line overcab section which means it can actually sleep six folk in three double beds. 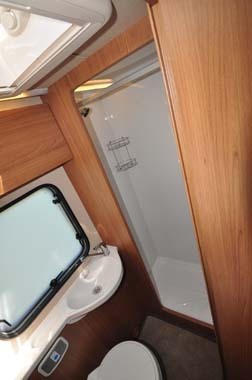 That pod is a no cost option over the Lo-Line, which is home to storage lockers and also gives the Imala a slighter lower 3.03m overall height. The other option you’ll find impossible to forego is the Media Pack of technical goodies (see below), which – because every Imala sold comes with it – we’ve included in the official starting price here. As you’d expect with any vehicle bearing the Auto-Trail badge, there’s plenty of luxury – starting with the coloured cab and (decorative only) roof rails. 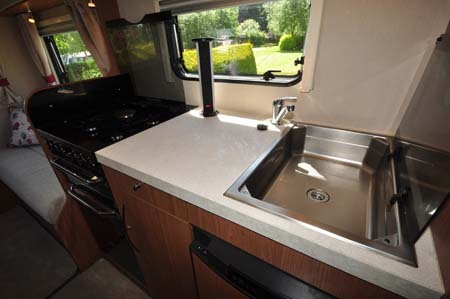 The coachbuilt body has tough GRP sides and comes with the backing of a ten-year warranty. Aspects such as the windowless habitation door hint at the lower- budget status of a vehicle like this. 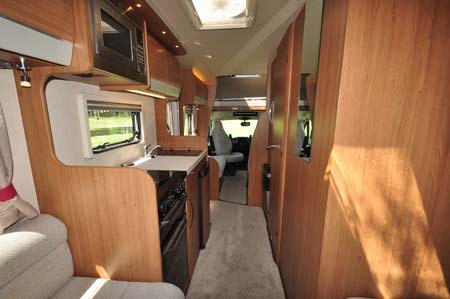 The interior, however, is a good example of a floorplan that appeals to us here in the UK. That’s thanks to the rear lounge – two short settees here, with views out to three sides – as well as a half dinette immediately behind the driver and inward-facing settee behind the cab passenger. Swivel both those cab seats and you have another sizeable lounge area. There’s also space for up to six folk to sit down to dine here – the table’s swing-out extension piece really helps here, too. Do check the cushion support in both lounges, though. It’s rather on the soft side and “bottoms out” just a bit too easily. All this leaves space in the centre of the ‘van for the kitchen (nearside) and a washroom and wardrobe (offside). Neither of these could be described as stinting – both areas are arguably more critical in a family vehicle where washing/toileting and cooking on board may well have higher priorities. The kitchen benefits from a cooker with dual-fuel hob with separate oven and grill, plus a floor-level pan locker. There’s also a Dometic 8-series fridge with AES (automatic energy selection) and removable freezer compartment, which means you can turn the whole unit into a larder, as required. There’s some worktop, where you’ll also find a handy, pull-up three-gang mains socket. It’s only the sink that needs a rethink – large and rectangular, it will take too much water to fill it. Get a washing-up bowl, would be our advice here. There’s a similar mix of praise and criticism in the washroom. On the plus side, there’s sufficient space for a step-in, properly lined shower cubicle. There’s also a swivel-bowl toilet, but the handbasin is tending towards being too small. As a sum-up, throughout this Imala there’s a bit of a mix of traditional and modern. Count among the former the Truma fire, whilst the latter includes concertina blinds and safety features such as Fiat’s Traction+ and Hill-holder (part of its ESP, electronic stability programme). Plus, it’s good to see Auto-Trail has finally recognised the need for positive catches on overhead lockers. 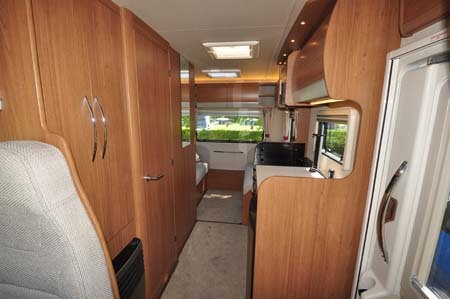 This type of coachbuilt motorhome is one where British makers tend to reign, but Auto-Trail has added something to the sector with its Imala 720. In-a-nutshell: A good balance of seating/sleeping, washroom and kitchen… just watch the payload! 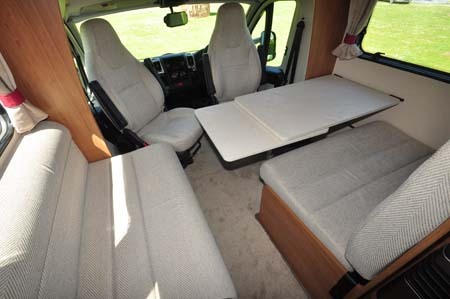 There’s more information on the Esprit 412 on the Auto-Trail website and to find out more about our low-cost premiums visit the motorhome insurance discounts page. *Motorhome insurance cost based on 2015 Auto-Trail Imala 720 valued at £47,144. Fitted with Thatcham Category 1 alarm and manufacturers immobiliser, kept at home at TD9 8BD. Motorhome owners – professionals over 50 years old with no claims, convictions or health conditions in last 3 years. 4 years no claims bonus mirrored from car policy and 2 years motorhome driving experience. Members of motorhome club doing less than 7000 miles annually. £250 excess applies. European cover included. European Breakdown £42 extra. Premiums include insurance premium tax at 5% and are correct as of 15.09.10. As you said in your article, alot of motorhomers aspire to the Autotrail marque, we are one of them. We purchased our Autotrail 4 years ago & at first we were over the moon with the luxery & quality compared with our previous motorhome. Then this year a few things started to go wrong, “not a problem” I thought, I’ll replace them? Telephoned Autotrail, only to be told that the firm who manufactured the required part had ceased trading & there were no parts available! I don’t know of any other industry where this would be permitted. A 4 year old Motorhome that can’t be used due to the total lack of aftersales service, it is criminal. Luckily I managed to find an independent repair firm who managed to fabricate the parts required from scratch. My point is that a brand like Autotrail that I’d always regarded as the Rolls Royce of British Motorhomes should consider the fact that even Rolls Royces require replacemnet parts now & then. Consider your loyal customers Autotrail & create a parts department which would greatly enhance customer satisfaction!